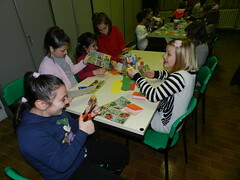 On December 29, the Servant Sisters in Brignano organized a special get together for girls. We took advantage of the fact that the girls were on Christmas vacation and we invited them to have a sleepover at the convent. 18 girls participated and three older girls came to help us. The girls arrived around 5:00 in the afternoon. First we did a few games until they all arrived. Then, we went to greet Jesus in the Chapel to officially begin the get together with Jesus and under His protection. Then we held a workshop that consisted of making a calendar for the New Year, as we were almost at the start of the year 2015. Afterwards we had dinner and then we saw the movie 'Toy Story'. We had told them that they had to be very attentive in order to come up with their own conclusions and to share them later. We talked about friendship, envy, the example of obedience and the need to know yourself. After these reflections and some time for games, we went to bed, but before that we went to the Chapel to say good night to Jesus. The following day, after breakfast, we had a long time of prayer in the chapel before the Blessed Sacrament. During prayer, which lasted almost an hour, the girls wrote a letter to the Child Jesus, following the example of Nenolina, a girl of whom we spoke to them about and whom they liked a lot. 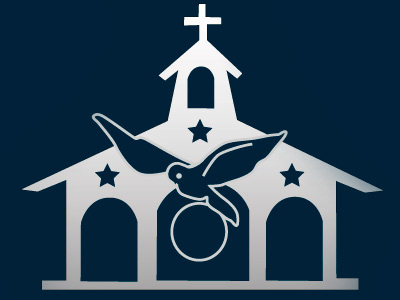 The rest of the morning we split into different groups because many of the girls had to come with us to the parish to practice for the Christmas play that would take place on January 6. The others remained in the house with the other sisters, playing and practicing sewing, trying to make an angel. It was a beautiful and good experience for all. They left eager to repeat it soon.